My mantra is “life-long learning begins before birth.” How do we ensure every child has a good start in life? A “good start” means born healthy and develops optimally during the important first two years of life, which lay the foundation for future milestones and successes like graduation from high school. For many babies in Indiana, Nurse-Family Partnership (NFP) makes the difference between a good start and a less-than-optimal start in life. NFP nurses visit low-income, first-time mothers during pregnancy and the first two years of the child’s life. Typically, a trusting relationship develops between the mother and the nurse, as well as the child and even other family members — truly a dual- and sometimes a multi-generational influence. 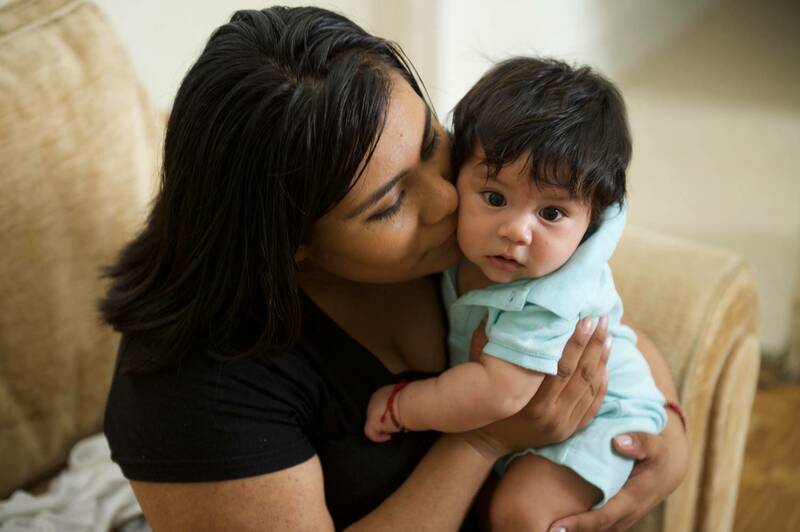 These three stories from NFP nurse Vanessa illustrate what happens when a competent, caring NFP nurse connects with families, supporting a child’s good start in life as well as families’ efforts to improve their lives through wellness, education and employment. When a serious medical condition threatened both a first-time mother and her baby near the end of pregnancy, Vanessa’s good clinical judgment and trusting relationship with the pregnant teen and her family influenced the baby’s good start in life. Vanessa was meeting with the teen mom for a regularly scheduled home visit. The pregnant teen felt like everything was fine, but the nurse recognized the signs of pre-eclampsia (severe edema, sudden weight gain and high blood pressure). The nurse convinced the teen’s mother to take her daughter to the emergency room, where she was admitted and gave birth by C-section. Now the baby is a healthy 14 month-old whose development is normal in all areas. The child’s mother is continuing her education at The Excel Center, Goodwill’s high school for adult learners, and will graduate soon. Both continue to meet with Vanessa. Breast milk is the best food a mother can provide for her baby, providing multiple benefits. Breastfeeding success improves when mothers have education about best practices and support. NFP nurses encourage and support their clients in whatever decision they make about breastfeeding. When a young teen who engaged with NFP decided she wanted to breastfeed, Vanessa — who is a Certified Lactation Counselor (CLC), like most NFP Indiana nurses — knew that to provide effective education and support, she would need to meet the young mother at her level of understanding. Instead of simply providing the young mother with resources, Vanessa created “movie time,” complete with popcorn and her client’s favorite pink lemonade, to view NFP’s excellent breastfeeding videos. The result: a young mother gave her baby breast milk for his first three months of life. Now the mother is continuing her education online, earning A’s and B’s, and wants to be a nurse. Vanessa’s experience, creativity and critical assessment of how to best help this mother helped another baby have a good start in life. Another mother, with a significant medical history, had her first child when she was in her early 30s. The baby was born slightly early at 39 weeks. When Vanessa conducted a routine developmental screening — the Ages and Stages Questionnaire (ASQ) — at four months, the baby seemed on schedule for all areas; however, Vanessa observed the baby was not bearing weight on her legs. Based on her clinical expertise, she referred the baby to Indiana’s early intervention program, First Steps. The program assessed the baby and determined an intervention was not needed then but was willing to re-evaluate in three months, if there were still concerns. Meanwhile, Vanessa contacted the baby’s primary care doctor, who gave the mother some activities to do at home. Vanessa worked with the mother and baby to do more tummy time, rolling over and weight-bearing activities. When the mother decided to have First Steps re-evaluate, the program then agreed physical therapy was needed to help the baby with leg and other movements. After four months of physical therapy, the baby was walking by 13 months. Fortunately, Vanessa trusted her observation and judgment to recognize a potential delay, rather than solely relying on the results of a developmental screen. Her early referral to First Steps and support for re-evaluation ensured that this child received the physical therapy she needed to be on target developmentally. Persistence paid off, and another child is off to a good start in life. These examples from one NFP nurse, Vanessa, are repeated every day with other NFP nurses who are visiting other mothers and babies. NFP is making a positive difference, improving babies’ starts in life, before they are born and beyond. Garrison Keillor said, “Nothing you do for children is ever wasted.” I agree. Joanne Martin, DrPH, RN, FAAN, has 40 years of experience with home visiting programs, with 30 years in maternal-child health leadership positions at all levels of government and professional organizations, including two years as Director of Healthy Families America and three years on the Secretary's Advisory Committee on Infant Mortality (SACIM). Currently, she is a consultant at Goodwill of Central Indiana for Nurse-Family Partnership. Dr. Martin also taught IU School of Nursing graduate students from 1985-2011.